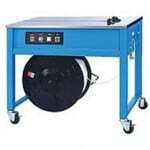 We have been providing all types of Strapping Machines for many years, and have a wealth of experience in this area. We are pleased to supply and stock the Akebono machines, suitable for a wide range of requirements. 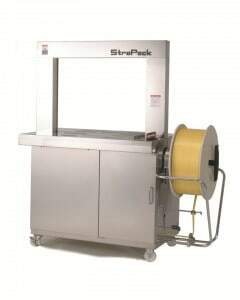 We also provide Sales, Service and Maintenance for a range of strapping machines including TMS, StraPack, and more. The RAN-505 has proved one of the most reliable machines available to the consumer today. It is based upon the Akebono 510 which has been in service for over 10 years. Akebono are one of the world’s leading manufacturers, with great success in the European newspaper industry in particular. This new range is set to follow with equal success. 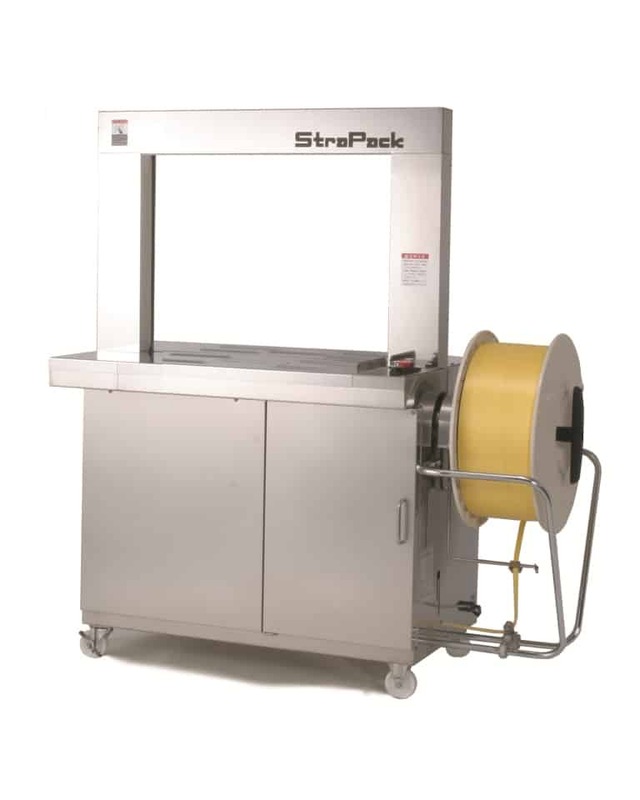 Being fully automatic it accepts strapping from from 5mm to 12mm, and has high-value features such as automatic feed into the Machine, and missed strap ejection as standard. 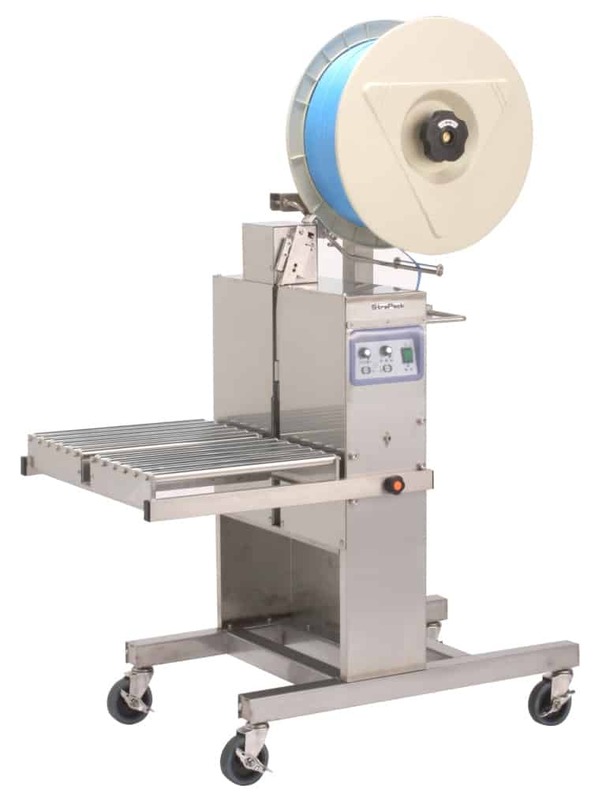 Most machines are being sold set to narrower strap widths, such as 5 mm or 9 mm giving the user longer coil lengths, and less down time changing coils. At the same time it illustrates the high quality of this machine to consistently run such narrow straps. The standard arch size is 600mm wide by 500mm high; however other arch sizes are available and can be tailored to your particular requirements. Warranty is 6 months on site. Please click below for PDF. The RQ-8 is a high speed, reliable automatic polypropylene machine suitable for a range of uses. For further information on RQ8 please click below for PDF. The RQ8X is available in Multiple arch sizes and can operate on 5mm to 15mm polypropylene strap, Therefore this machine can be tailored to meet your specific specifications. Fully enclosed control cabinet and reinforced lower cabinet protect against moisture. Side Seal Design: off, oil and debris. Self-lubricating design reduces wear & tear and increases operational life. Locking castors and Adjustable table height to 3 positions (624mm, 642mm, 664mm). Tension is adjusted via a convenient dial. Tension arm maintains consistent tension. Designed with a minimum of moving parts to increase motor life and reduce maintenance requirement. Specially designed for the food industry: stainless steel cabinet, arch, covers and bottom cover splash sheet. 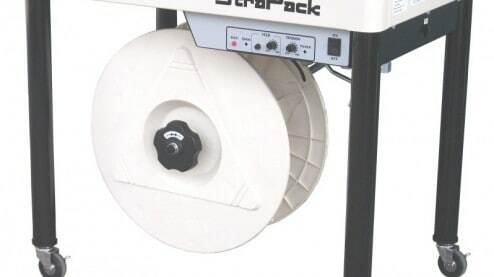 Machine can be easily moved using white nylon locking castors. Strap cycle is initiated when pack presses ball switch, enabling faster, two handed operation. 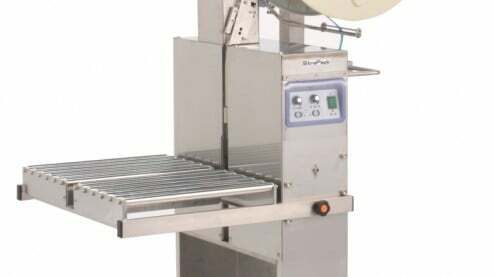 If operated without a pack in place, the strap forms a small loop which is ejected from the sealing unit leaving the machine ready for the next cycle. A wide range of tension can be selected via a single dial. Tension capability up to 80kg. Self-lubricating design and minimum amount of moving parts increases motor life and reduces maintenance requirement. Fully automated version, with conveyor belts built into table top (RQ-8 STSA 415v 3ph); Twin-arch, double-strapping machine (RQ-8 STSD); Lower working height (650mm) to integrate with existing conveyor line (RQ-8 STS LB). Speed 1.5 sec./strap, 40 straps per min. We also offer a range of used second hand strapping machines. Type of stock varies, so please give us a call if you have something specific in mind. These are reliable and strong machines which are very easy to operate. Simply feed the strapping around the package and into the strap guide and it will automatically tension and weld the strap. The machines will run the standard 7mm to 12mm polypropylene strap and are easily adjustable. We offer full after sales technical support together with a regular servicing contract (if required). Only requires a 13 amp socket. 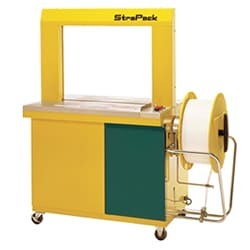 Warranty Meeting CE regulations this Strapping Machine is backed by a comprehensive warranty which includes parts and labour. For further information on TMS300 please click below for PDF. 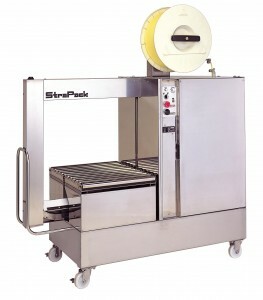 StraPack i-10 Semi Automatic Strapping Machine. 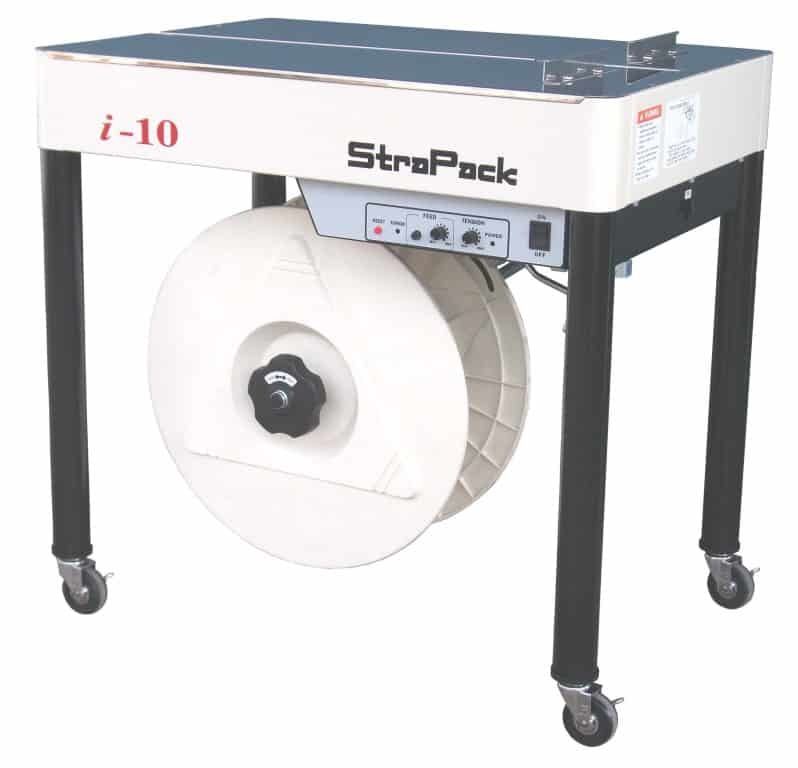 The StraPack i-10 is one of the latest StraPack models, and is a great machine for smaller companies and occasional use. It is a compact unit offering reliability, ease of operation and low maintenance costs. Adjustable Legs (table height adjustable from 755 – 905mm). Quick Start Up (just 45 seconds). Runs strap from 5mm – 15.5mm without change parts. Soft Tension option for delicate packs. Seal Time Extension for springy packs. This newer version is 22% quieter (only 67 dB(, 25% lighter (only 45kg), more energy efficient (only 0.25Kw) and has 30% less moving parts than before. The Stainless Steel Construction is deal for moisture-laden meat, poultry and seafood processing environments. It has a side sealing design and a fully enclosed cabinet with sealed bearings. The portable design ensures that the machine can easily be moved to different locations using locking castors. Two separate height positions available on the table. We supply Strapping Machines across the UK, along with sales, parts, service, and maintenance for all brands, makes, and models. Automatic and Semi-Automatic models available, both new and used.